The two companies leverage their successful platform integration to provide high value to multiple, top-tier customers in APAC and North America. NEW YORK & SINGAPORE — (February 12, 2019) — Kasisto, creators of KAI, the world’s leading Conversational AI platform for finance, and Moneythor, creators of the powerful data-driven engine to enhance digital experiences for banks and fintechs, today announced they are partnering to provide the industry’s first seamlessly integrated intelligent banking solution to financial institutions. KAI powers virtual assistants and chatbots across banks’ channels that engage in human-like, intelligent conversations. Quality data is one of the most important feeds to enable those conversations. Moneythor is able to aggregate and augment the bank’s data so it is more useful and ultimately actionable because it correlates an endless stream of disconnected data points to customer goals and behaviors. 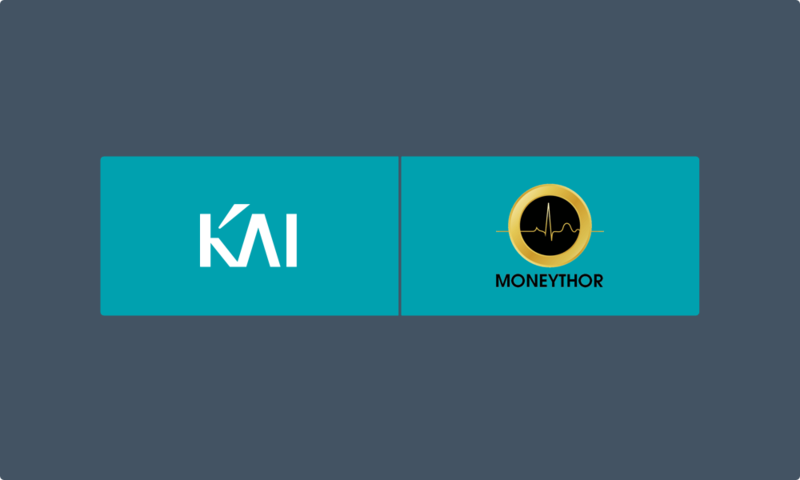 The partnership between Moneythor and Kasisto enables KAI to leverage data processed by Moneythor to deliver tailored recommendations, actionable insights, and contextual personal finance management advice. Ultimately, the bank’s customer gets a more personalized, differentiated and actionable experience as Moneythor enhances the bank’s raw data so the virtual assistant can focus on AI-driven proactive and predictive conversations. Moneythor’s data solution continually cleans, augments and enriches disparate and often uncategorized data, and then follows by generating proactive recommendations, insights and nudges, so Kasisto’s conversational engine can power engaging conversations about the customer’s financial life. For example, Moneythor’s engine may change “SBUX w24” in a bank statement to “Starbucks on 24th” and categorize it as coffee shop, while simultaneously crafting a contextual notification to alert the customer of a notable increase in their weekly expenses as a result of this transaction. KAI will utilize the data and the related personalized message to accurately read spending habits by category. This example would not only allow customers to ask questions such as “how much have I spent on coffee last week?” but also allows the bank to learn more about their customers’ spending patterns and offer savings products, location-based offers, and coffee rewards. Banks understand that their massive amounts of structured and unstructured data must be augmented, classified and analyzed before it can be meaningful to their customers. In fact, FIS reports the leading financial services firms are leveraging data to improve their customer relationships and work with customers on how to make their services more relevant; 57 percent said data management investments have improved how they share data and helped build closer relationships, the survey noted, compared with 25 percent of the rest of the industry. Capgemini’s finding (PDF) that customers are willing to share more information with banks if banks can provide personalized experiences and relevant value propositions similarly support the need for intelligent, personalized conversations. KAI is the leading Conversational AI platform for the finance industry. Kasisto’s customers include Wells Fargo, J.P. Morgan, Mastercard, TD Bank, Standard Chartered, DBS Bank, among others. They chose KAI Banking for its proven track record to drive business results while improving customer experiences. The platform is engaging with millions of consumers around the world, across multiple channels, in different languages, and is optimized for performance, scalability, security and compliance. Built with the deepest AI portfolio in the industry, KAI includes platform tools and services to customize and continually improve consumer experiences as well as seamlessly add new features, channels and markets. For more information visit www.kasisto.com. Moneythor develops software providing more intelligent and contextual digital banking for customers and enhanced marketing and analytics for financial institutions. The Moneythor solution comes as an easy-to-implement set of software components delivered as APIs enabling banks and fintech firms to offer improved functionality and experience to their retail & business customers through their digital banking services. The Moneythor solution has been deployed by large international banks such as ANZ, CIMB, Credit Mutuel Arkea, DBS Bank and Standard Chartered, fintech firms such as Raiz as well as digital banks such as Orange Bank among others. For more information visit www.moneythor.com.